What’s the Project? 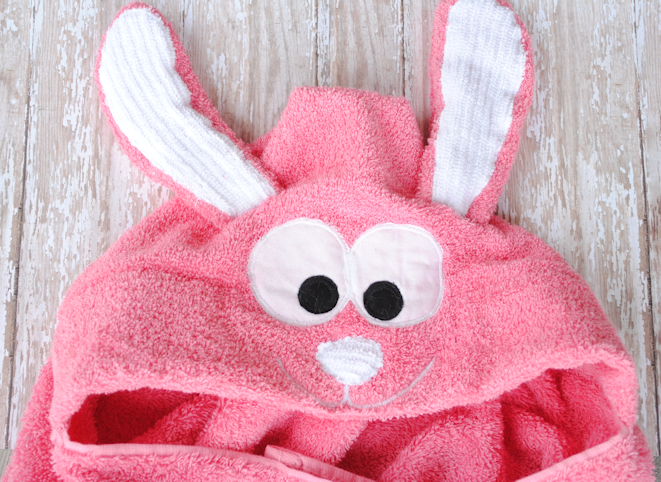 This cute bunny hooded towel is a fun towel for any little one for Easter or for any time! 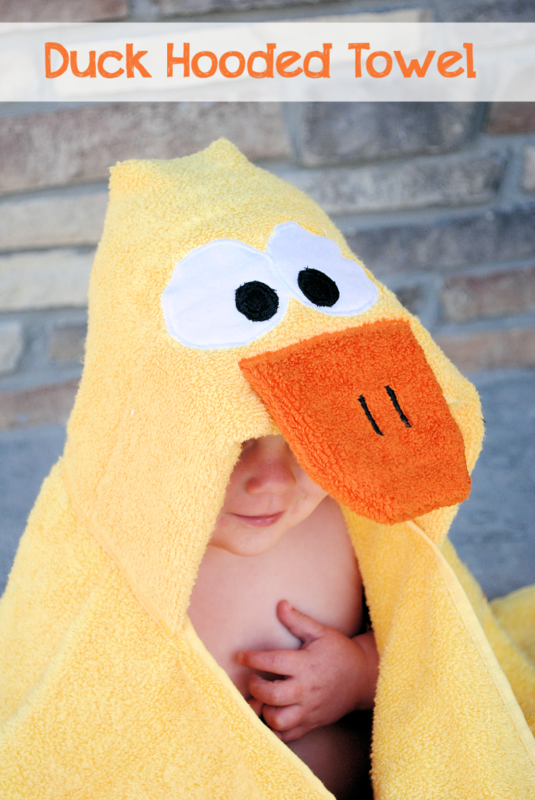 An easy to follow pattern to make this great hooded towel that is great for the littlest of babies up to elementary ages kids. This makes a fun gift! You knew I had to do an Easter hooded towel! I’ve had a lot of requests for this one, so here it is. 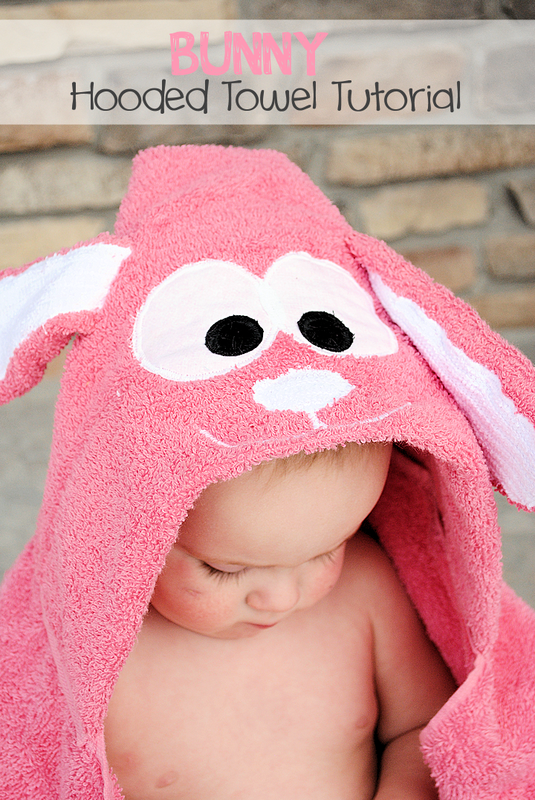 A pink, floppy eared, perfect for Easter…Bunny Hooded Towel! 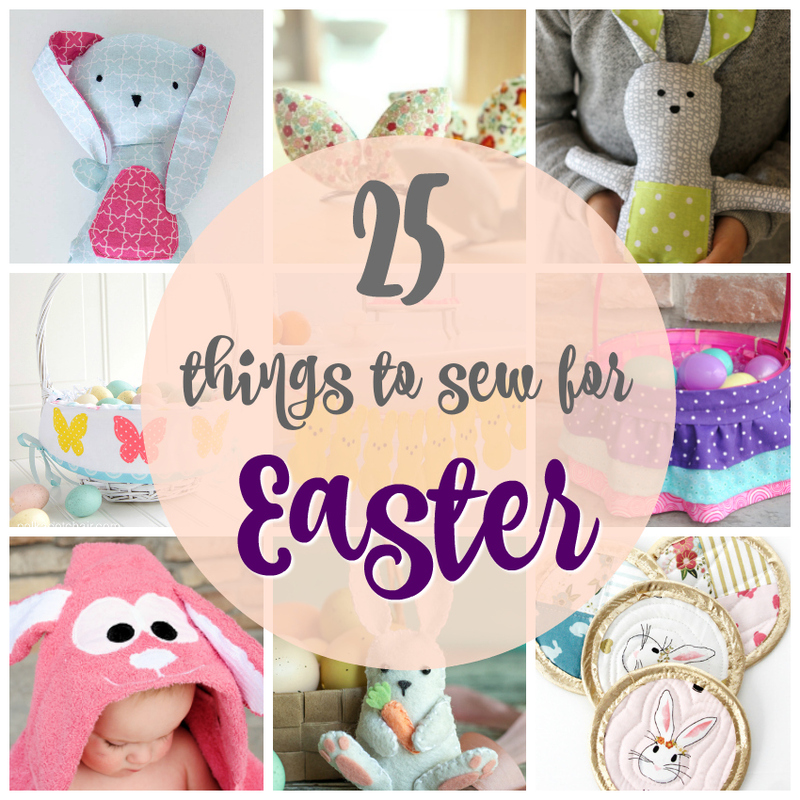 I am posting this early enough that you have time to make it for Easter. 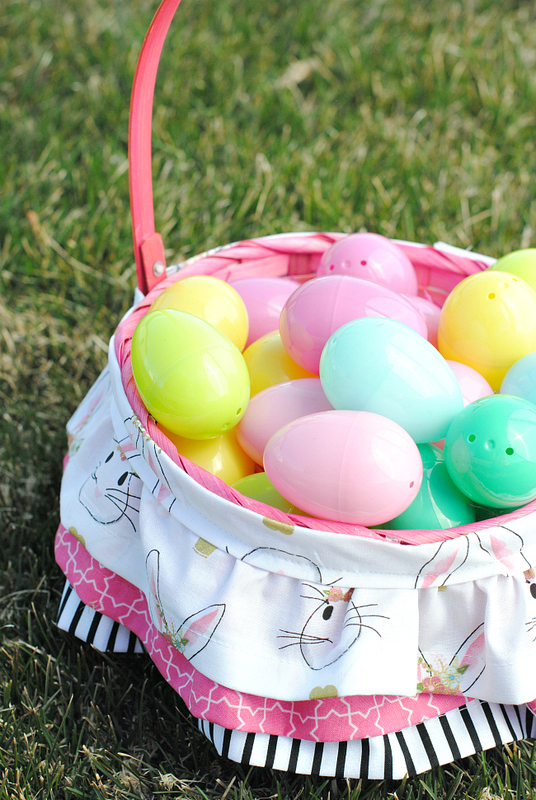 This would make the cutest little Easter gift for a little one! This might be one of my very favorite hooded towels out of all of them. So cute isn’t it?! Does he make you feel all springy? I am so happy that Spring is finally coming! I have done lots of hooded towel tutorials. I am not going to teach you the basics of how to do the hooded towel in this tutorial because I have a whole post dedicated to that. Go here for full instructions. I am teaching you how to make the face in this post. 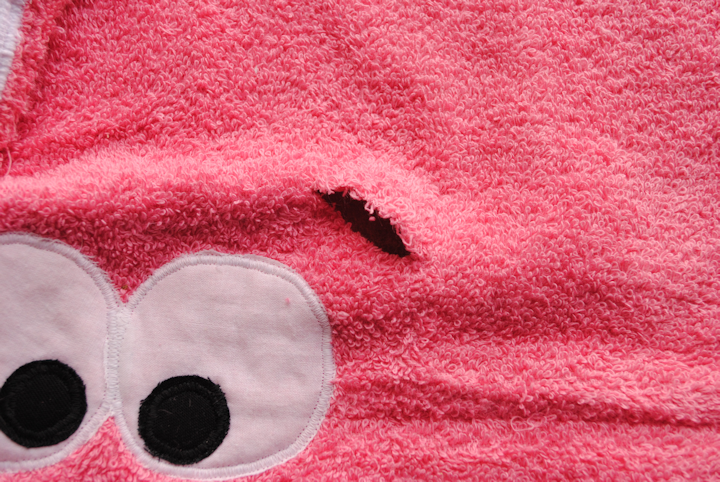 So to make the funny face, let’s start out by cutting our hooded towel in half horizontally. Now fold the selvage edge under about 3 inches. Flip that side over so you are working on the bottom (the side without the seam). Cut your eyes out of the white and black fabric. Also, cut your heat n bond in the same sizes. Place your eyes where you want them (leaving room for the nose in front of them) and iron them in place. Then applique around them. Now, cut your ears out. 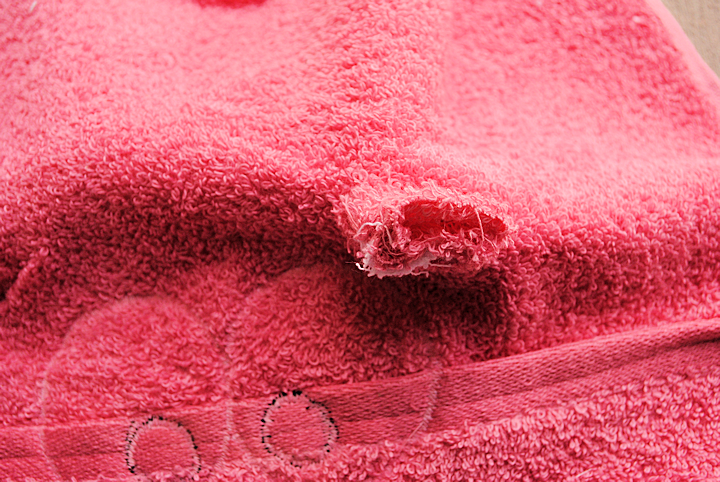 Cut 4 pieces from the extra half of your pink hand towel and then 2 inner pieces from the white. 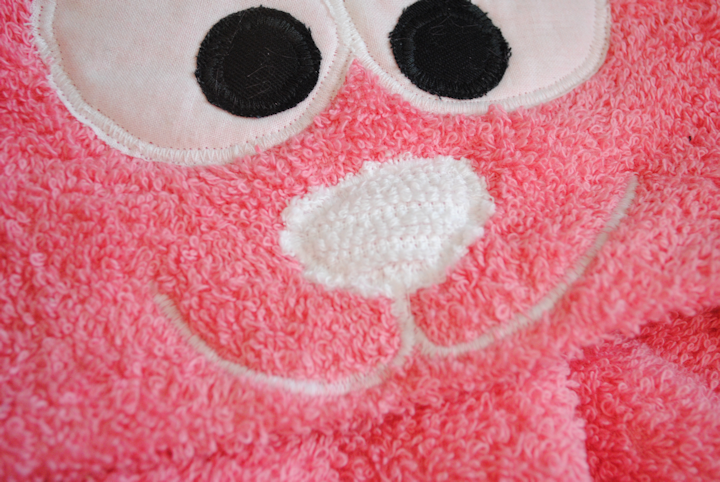 Grab 1 of your pink ears and applique stitch your white piece to it. 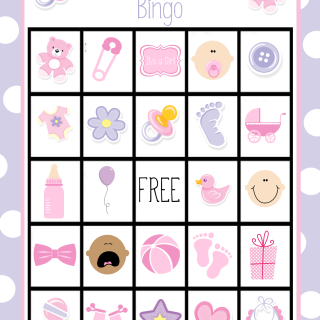 Do that again with the other white piece and another pink. Now place right sides together on the ears and sew around them. Turn them right side out. Do this for both ears. 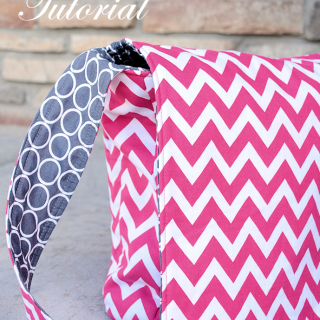 For the rest of the instructions visit the basic hooded towel tutorial. If you want to round off his head like I did, visit the frog hooded towel tutorial. And that’s it folks! 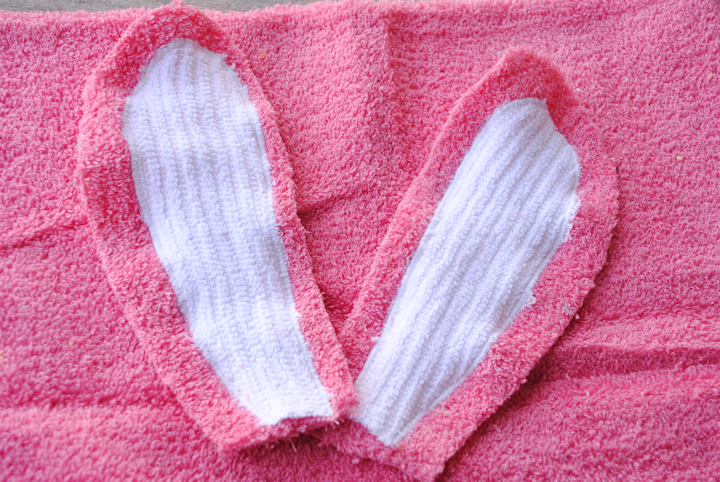 A pretty great bunny hooded towel. omg… this is too darn cute! Love this towel!!! I have a few friends who are having babies this year I might just have to make them a few of these! Super cute. What a great idea. 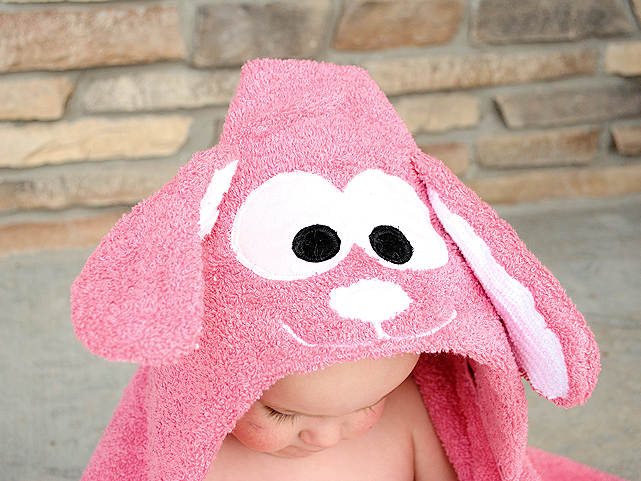 Another adorable hooded towel. Do you have templates for the ears and face features possibly? Thank you for the the cute tutorial. Your site didn’t take too long to load… but it wasn’t really fast either… but then it could be my computer….so all is ok, as far as I’m concerned ! Absolutely adorable and cute!!!! Love it! This is so adorable! Great job! Awwww, shucks! This is adorable (so is the ducky one). You are the kinda grown up that makes bathtime FUN! I can’t get over how cute all of these towels you’ve made are! Darling! I saw them on Ucreate and TT&J today. SO adorable! Love them! This is ADORABLE!! Love it so much! So cute…and I love that shade of pink/salmon!!! This is precious! 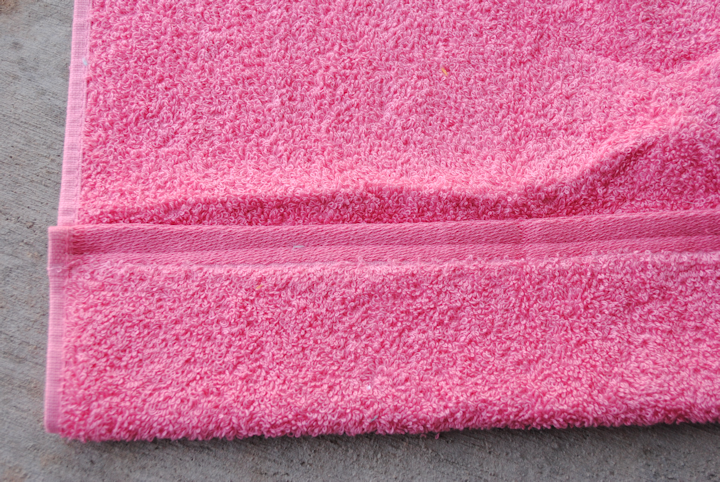 I have made hooded towels for my kids before, but I haven’t tried anything quite this cool. Have you done any other animals? This is so adorable! Congrats on being featured on Six Sisters’ Stuff! New follower here. Would love it if you’d stop by my site…especially for my Wonderful Wednesday Blog Hop! I just made my first bunny towel and I love it!!! I gave it a little fluffy white bunny tail and I’m debating whether it needs little felt buck teeth lol thank you so much!!!! Awesome! I’d love to see a pic if you add the teeth. Love the bunny towel! I’m a little confused by this direction – “So to make the funny face, let’s start out by cutting our hooded towel in half horizontally. Now fold the selvage edge under about 3 moments.” What are moments as a measurement? Thanks… I figured that out once I read the duck tutorial. You might also want to change hooded to hand towel in the same paragraph. It all makes sense to me now. The towels are delightful and I’m going to give one of them a try this weekend. Thanks! I’m super excited to make these. They will be Christmas gifts for my five kids and all my young nieces and nephews! I have a dumb question (I know it’s dumb because no one else has asked it). When cutting the hand towels “Horizontally” are we cutting them horizontally LONG or Short. Will it make more of a square (short) or a long rectangle (long). So tough to put into words! Thank you so much! I just love your hooded towel tutorials! Wonder if you would do an Elsa (from frozen) hooded towel. I have a couple of pictures of these that I found on Pinterest. They’re for sale, but I’d MUCH rather make mine. Not sure how to attach a picture here, but I could email you them. Thanks!! I have thought about it! I will add it to my list.